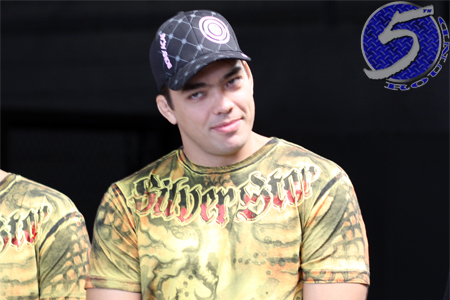 Not the UFC Fighter Rankings mean much of anything when it comes to next dibs at the title, which is really the only thing that matters when you don’t don the hardware, but former light heavyweight champion Lyoto Machida (pictured) has emerged in the middle of the middleweight pack following Saturday’s KO victory over Mark Munoz. Machida is currently ranked #5, taking the place of Munoz who dropped two slots after the loss. In addition, “The Dragon” remains rated in the Light Heavyweight totem poll at #10. The Brazilian did not make the Pound-for-Pound list. Middleweight champion Chris Weidman sits atop the UFC middleweight throne, so he’s not ranked (don’t get me started on the logic of rating each division’s champ #0…). Former king Anderson Silva is listed at #1, followed by Vitor Belfort, Ronaldo “Jacare” Souza and Michael Bisping. The rankings are updated after every UFC event by tallying the polls submitted by select members of the MMA media.